That's according to a report released Monday by CTIA, a trade association for the US wireless industry. The study, which was conducted by telecom research firms Analysys Mason and Recon Analytics, found that China is most prepared to launch the next generation of super-fast wireless technology. South Korea is second, while the United States ranks third. 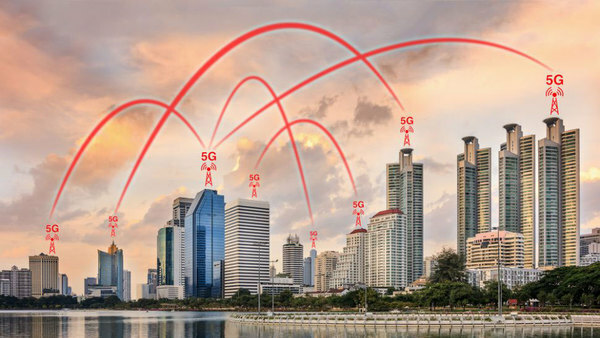 Around the world, mobile carriers are sprinting to adopt 5G networks, which will ultimately be used to power self-driving cars, virtual reality and smart cities. Whichever country gets 5G networks up and running first will have a huge global investment and hiring advantage. The US wireless industry is prepared to pump $275 billion into 5G deployment, which could boost the country's GDP by $500 billion, according to a 2017 Accenture study also commissioned by CTIA. It could also create up to 3 million new jobs, the study said. Tens of thousands of people will be tapped install the necessary infrastructure. After that, high-speed 5G will support all kinds of technology companies, especially those that focus on smart cities — and they'll start hiring, too. But right now, there's fear that the United States lags behind. "China holds a narrow lead in the race to 5G thanks to a combination of industry momentum and government support," the CTIA report said. There are a few things that need to happen to make a broad commercial rollout of 5G a reality. Companies need to invest in research and development. But the government also needs to allocate additional radio frequencies to wireless companies, since 5G requires more bandwidth. The CTIA analysis notes that Beijing plans to deploy 5G on a large commercial scale by 2020, and China's top carriers have all pledged to meet this timeline. The Chinese government has also already distributed a good portion of the necessary radio frequencies. "China benefits from extensive coordination between government and industry when it comes to telecom," said Dan Hays, a consultant at PricewaterhouseCoopers who specializes in telecom issues. South Korea, meanwhile, gained a lot of momentum due to this year's Winter Olympics, which provided "a focal point for early investment, research, and trials," according to the report. The United States, in third place, remains "near the top," the report said. Wireless providers like Verizon (VZ) and AT&T (T) are charging ahead, and want to start launching their 5G technology in select markets before the end of 2018. Despite the current state of affairs, many experts still believe the United States could come out on top in the end. "We may have lost some early battles in the war for 5G supremacy, but we haven't yet lost the war," Hays said. The United States needs a clearer schedule for the allocation of radio frequencies, like what's been announced in China and South Korea, CTIA said. Plus, lawmakers still need to enact some necessary legislation to make way for an infrastructure overhaul, according to the report. CTIA itself is lobbying for such reforms. "The United States will not get a second chance to win the global 5G race," CTIA President Meredith Attwell Baker said in a statement. " ... Today's research highlights the importance of policymaker action in 2018." The US government has indicated before that it wants to win the 5G race, and is cognizant of the threat coming from China. Last month, President Donald Trump blocked Broadcom's $117 billion bid for Qualcomm(QCOM) due to national security concerns. The deal, which would have combined two computer chip makers, had been under investigation by the Committee on Foreign Investment in the United States, or CFIUS. The inter-agency panel, which vets deals that could give a foreign investor control of a US business, said one big concern is that a takeover would cause the United States to fall behind on the development of 5G technology, allowing China to take the lead. Qualcomm, a leader on 2G and 3G wireless network technology, has been investing heavily in 5G research.